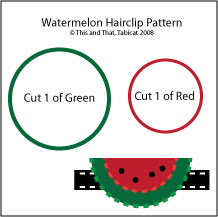 Here's a little watermelon clip modeled by your's truly. 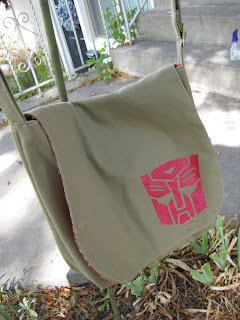 Skill Level: It's another EASY project, perfect for beginners learning to embroider. 2. Cut each circle in half to form four semi-circles. 3. Embroider around each red semi-circle using a blanket stitch and red embroidery floss. 4. Embroider around the curved edge of each green semi-circle using a blanket stitch and green embroidery floss. 5. Place one red semi-circle on each green semi-circle. 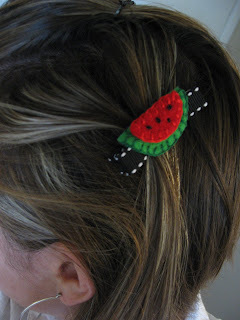 Use black embroidery floss and a french knot stitch to create the watermelon "seeds." I stitched four seeds through both the green and the red felt. 6. Cut 3" of ribbon. On each end of the ribbon, fold about 1/4" to the backside and secure with a dab of hot glue. 8. Glue watermelon to clip.